Posted by Iris Yan on 2/14/2019 11:36:47 AM. According to CNN Business, "Barnes & Noble attributed the decline to a drop in store traffic. Online sales also dropped 14.3% because of fewer promotions, including in Barnes & Noble's Nook tablet business". As time goes, readers don't hold so much confident on Barnes & Noble's business, so does the Nook eBook bussiness. 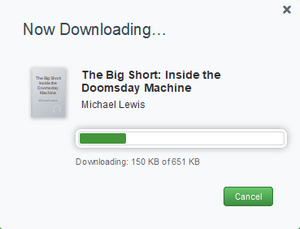 Actually, Barnes & Noble is the first company who reduces the download options among the major eBook vendors. Now, it is very hard for readers to download the Nook books to their computers because they have discontinued the Nook for PC/Mac and web downloading options. I know many people have consumed ebooks in this store for a very long time. This step is another way to push away the customers who want to purchase ebooks. In my aspect, this action will take some responsible for the decline of Barnes & Noble's revenue. To address Bares & Noble's wrong action, I will share 3 different ways to download Nook books. Although Barnes & Noble had tried hard to discontinue the Nook book reading on computer, we still can find valid ways to download Nook books to computer, especially for Windows system users. Here are different tools I want to share to download Nook books to Windows system. I have tested and ensure the three method are still working. Update 1/4/2019: This method does not work any more since 1/1/2019. Many users reported that they will get error code when they try to download the books via Nook for PC although they still can log in their account and read the Nook books via Nook for PC. When reading this title, you may think where can I find the old version of Nook for PC as Nook has already discontinued this application. Here I have prepared the installation package for you here. 1. Download & install this software on your Windows computer. 2. Run Nook for PC and log in Nook account by inputting the email address & passwords. Then click on "Sign in" to login your Nook library. 3. 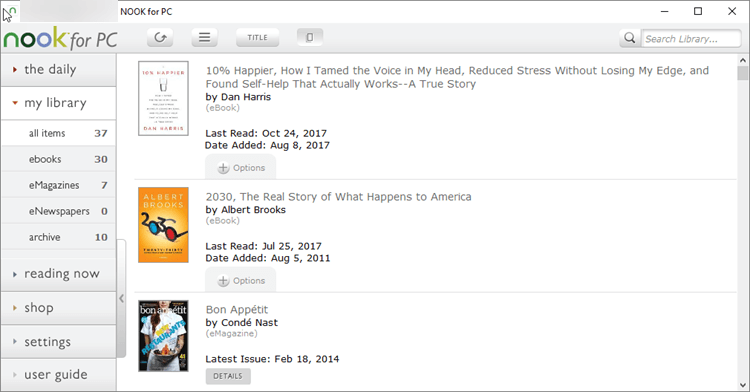 As you have logged in, click on " Library" tab at the left side bar, and you can see your books have been listed at the right main interface. 4. 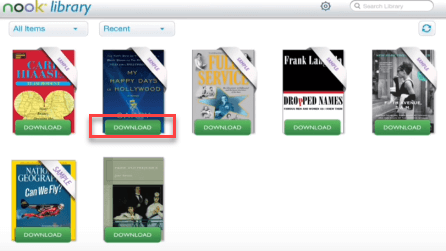 To download Nook books, you can either click on the book cover to download the ebooks or click on "Option"-->>"Download" to download Nook books. 5. As you can see that this book has been successfully downloaded to my Windows computer. As an alternative, Nook offers the Nook for PC reading app on Windows Microsoft store. If you are using Windows 10 or Windows 8, you can log in your Windows store to search "Nook" apps and install it at your computer to get your Nook books downloaded. 1. Launch Nook for PC and sign in with your Nook account information. 2. When you log in, all Nook books will be displayed at your Nook library. If the book is not downloaded, there will be a download icon at the top left corner. Just click it to download Nook books to your computer. I have test this method about half a year ago and ensure this method still works. But when I try this application at my Windows again today, I can not log in my account any more. Below is the error message when I try to log in my account. It never let me sign in successfully even my account information is correct. If you like, you can still give a shot. Please let me know is this method still working on your area. Below is the valid installation package I collect for you guys. Step 1. Run Nook study on your PC, fill in your Nook account information and close it before times out. Step 2. Re-open Nook study, your will see there is a processing bar in the login window showing that Nook is loading your library. Once your library has been loaded, you will see all your Nook books at your Nook library. Step 3. Click the book cover, you will download your Nook books successfully. I have tested this method for many times, and it works like a charm. Just give a try, and it will not let you down. I know many people do not have the Windows computer, but only Mac. If you want to download your Nook books to mac for backup, this is really a challenge but you still can achieve this goal follow the following workaround. As I have mentioned in above part that we can still find some ways to download Nook books to Windows computer, why not change your Mac to Windows? Yes, I mean install Windows system on your Mac computer. I know some of you alrealy are dual-boot users. So you can follow the above instructions to download Nook to Windows system. If you only have one system on your Mac computer, installing the Windows system is still a work around. If you think this is worth to try, you can search “How to install Windows system on Mac" to get the Windows system installed and then download Nook books to Mac. As Nook has its own eReader, this is the easiest way to download nook books. Below is the detailed steps. Step 1. Start your Nook eReader and sign in with your own Nook account information. Step 2. Go the library, and then tap the book cover to download Nook books to your library. Once the books have been downloaded, the download icon will be disappeared. Your books will be downloaded to your Nook eReader, but Nook books downloaded via Nook eReader are hidden so you can not find them. Besides Nook eReader, Kindle and Kobo are the most popular eReaders among the market. Many eBook lovers inquiry if there is any way to download nook books to Kindle or Kobo? Sure, you can get the answer from converting Nook to Kindle or read Nook books on Kindle. Step 1. Please go to your Apple store to search "Nook" to download and install your Nook app for iOS. Step 2. Launch the Nook app for iOS and then sign in with your Nook account information. When you log in, the Nook app will display all your purchased book. You'll also see that there is a "Download" button at bottom of your book cover. Just tap "Download" button to download Nook books. Step 1. Please download and install the Nook from your Google play store. Or you can get it from Nook official website. Step 2. When the installation has been finished, please launch it and sign in with your Nook account. Step 3. All books will be displayed at your library with the "Download" button beside it. 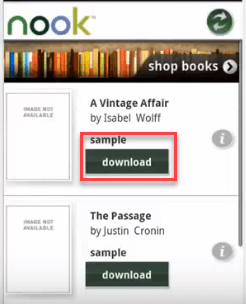 To download Nook books, just tap the "Download" button and the downloading process will start. Q: Why I cannot find the Nook books downloaded to my Nook? A: You can not see any books downloaded via your Nook eReader because they are in a hidden partition. If you want to back up your Nook books, please download Nook books to your computer and then run Epubor software to remove Nook DRM. Q: How to backup Nook books? A: For backing up Nook books, please read this article How to Backup Nook Books. Q: Where can I find the Nook books downloaded to my Windows? A: If you are download the Nook books via Nook for PC(old version) or Nook study, you can find Nook books stored here: Documents--->My Barnes & Noble eBooks. Epubor Ultimate can detect and decrypt Nook books both downloaded via Nook for PC and Nook app for Windows. Q: Why I cannot remove DRM with Epubor Ultimate? 1. Please ensure you have input your Nook account information to Epubor ultimate. You can input the account information by this way: click on "User" icon--Seetings--Nook-->>Input your Nook account information. Then go back to the main interface of Epubor Ultimate and drag the right side of Epubor Ultimate and the DRM will be removed. 2. If you ensure the Nook account information is correct, but the Nook DRM still can not be removed. Please download Nook study and try to log in your Nook study even the login is incomplete. As you do this, Epubor software is able to connect the Nook server to get the key to remove DRM from Nook books. Then run Epubor Ultimate to remove DRM and you will remove Nook DRM successfully this time. There are three different methods I want to share with you guys today. If you have any better method, please share in the comments. I just tried to follow the Nook Study directions without success. I had to install the package first as I had never used it. Perhaps it needs to have a profile set up first of some kind? 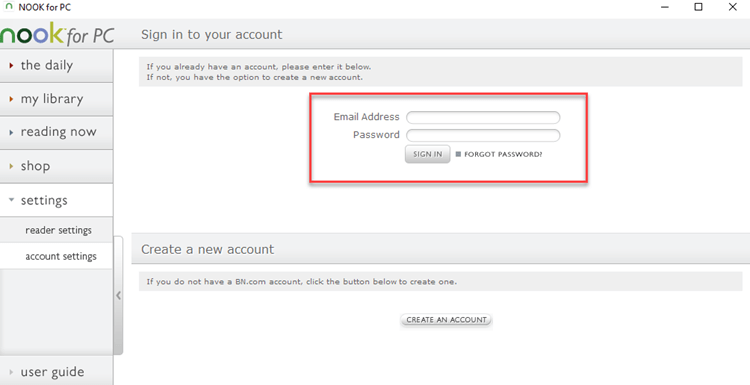 I enter my email address and password but no matter how quickly I close it I still have a blank form when I restart it. I also had never used Nook Study before and had to download it. When I tried to log in with my B&N info I received the error message that "A network problem has occurred. This may be the result of slow, limited or no connectivity. Please try again later." I have entered the info quite a few times but never got anywhere else. Any other suggestions? Thanks. I tried the old Nook for PC and it is giving me the same message as the other two comments. I am sick over this. There has to be a way to have a copy of my Nook books for myself. I am not buying another Nook as my newest (Glowlight3) has been a horrible device. I wish I would have downloaded my books when I could. I paid for them!! About 2 weeks before, Nook has discontinued the Nook for pc and nook study server. Therefore this is no way to download Nook books from Nook for pc or Nook study now. The only way to download Nook books is using Nook app for windows 10. So you have a try. I have tried the old Nook for PC and Nook Study and that didn't work per my previous comment. I just tried the Nook app from the windows store- I downloaded all of my books but they are not downloading to my computer - at least I can't find them anywhere after searching thoroughly. I guess Barnes and Noble have figured out a way to keep them in the app and off my computer? I'm not tech savvy and do not understand how apps work. Do you have any other ideas for backing up my Nook books? Try to download the Nook books via Nook Windows app. This is the only way to download Nook books for now. I've tried all the options including searches via file extension, manually typing in the path to the files etc. Nothing works. I tried downloading the books through the Windows app. When I click on the icon on the upper left of a book, nothing happens. It gets stuck without downloading. Any help? Recently, the Nook has changed many things, ever stopped their server for Nook for pc and nook study. So we are not sure what happen exactly. You can login and out to try more times. Or you can just contact Nook customer service to see what happened.